© Xinhua/Sipa USA/TNS Chinese President Xi Jinping, rigt, holds a grand ceremony to welcome U.S. President Donald Trump at the square outside the east gate of the Great Hall of the People in Beijing, capital of China, November 9, 2017. An already tense relationship between the United States and China has grown increasingly poisonous this week amid a new spying charge, a rapid escalation of a trade war and an accusation by President Donald Trump of election interference. The sharpening rhetoric and actions, including an espionage arrest in Chicago and tough words at the U.N. Security Council in New York, are playing out as America's unease about China's global role grows and the Asian giant becomes increasing confident about projecting its power overseas. 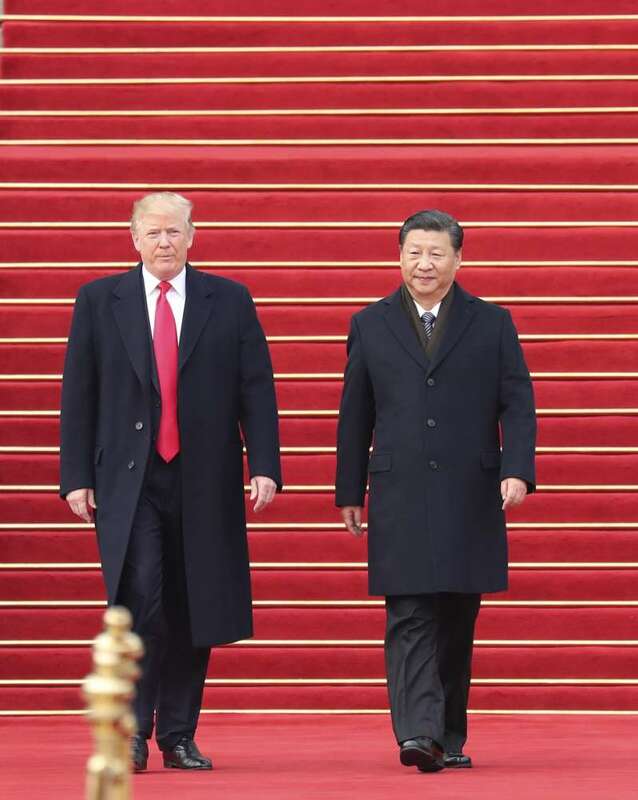 Although the U.S. and Chinese economies are deeply entwined, some fear that the Trump administration is intent on decoupling America's economy from China's, a strategy that would have a seismic impact on the global economy. In his latest swipe at China, Trump accused Beijing of interfering in the November U.S. midterm elections because it does not want him to win after his tough actions on trade. "Regrettably, we found that China has been attempting to interfere in our upcoming 2018 election," Trump said in a speech to world leaders at the U.N. on Wednesday. "They do not want me or us to win because I am the first president ever to challenge China on trade." "We did not and will not interfere in any country's domestic affairs," Wang Yi, China's foreign minister, said in reaction. "We refuse to accept any unwarranted accusations against China." Wang, China's top diplomat, also warned Wednesday against a Cold War mentality between the U.S. and China. "China and the United States can have competition, but should not use a Cold War mentality to view each other, and nor should they slip into the trap of a zero-sum game," he said. "Recently, certain U.S. forces domestically have been continually blackening China's name, creating antagonistic feeling, which has caused serious harm to the atmosphere of Sino-U.S. ties." In recent days, talks to resolve conflicts have been canceled and tensions have risen over China's territorial claims in the South Chinese Sea and Taiwan. Recent U.S. sanctions on a Chinese military agency for purchasing Russian military aircraft and a missile system, and Chinese anger at the U.S. over its sales of parts for fighter jets to Taiwan, have deepened the antagonism. On Tuesday, Chinese national Ji Chaoqun, 27, who joined the U.S. Army Reserve in 2016 after graduating with a master's degree in electrical engineering in Illinois, was arrested in Chicago. He was charged with gathering background material on eight individuals working or recently retired as scientists or defense contractors and emailing it to a provincial Chinese intelligence officer. Others recently accused of Chinese spying or theft of intellectual property include a former Apple engineer, a former IBM software engineer, a General Electric engineer, a scientist who worked for GlaxoKlineSmith and several former U.S. intelligence officers. Those accused included Chinese nationals, naturalized Americans of Chinese descent and Americans not of Asian descent. The alarms sounded about spying have come from Trump down. At a New Jersey dinner with CEOs last month, the president expressed concern that many foreign students were spies, comments made as part of a long attack on Chinese trade practices, according to media reports. In February, FBI Director Christopher Wray told a Senate Intelligence Committee hearing that espionage by Chinese students, academics and scientists posed a "whole-of-society threat" that required "a whole-of-society response." In July he called Chinese espionage "the broadest, most challenging, most significant threat we face as a country." He said China's ambition was to be the dominant economic superpower, adding that investigations of Chinese spying were underway in 50 American states. "It covers everything from corn seeds in Iowa to wind turbines in Massachusetts and everything in between," he said. The volume of it, the pervasiveness of it, the significance of it is something that this country cannot underestimate." "Disparaging and stereotyping an entire population is wrongheaded and un-American, and especially disturbing when the source is our national leaders, whether in the White House, the Congress or the FBI," said a statement by United Chinese Americans, a federation of Chinese American organizations, last month. Congresswoman Judy Chu, D-Calif., called Wray's comments reckless and complained of a growing "dangerous narrative" in America that Chinese students and scholars be subjected to sharper scrutiny than others. It reported that 52 percent of defendants charged under the Economic Espionage Act since 2009 are Chinese, while as many as one in five Asians charged with spying were found not guilty, a rate twice as high as non-Asian people. Those convicted who had Asian names tended to get harsher sentences, it reported. U.S. agencies have been issuing warnings about Chinese espionage for years. "Chinese actors are the world's most active and persistent perpetrators of economic espionage," a Pentagon report to Congress said in 2012. A June report by the White House Office of Trade and Manufacturing Policy said China deployed more than 40,000 intelligence agents overseas targeting strategic sectors such as electronics, telecommunications, robotics, data services, pharmaceuticals, mobile phone services, satellite communications and imagery and business application software. Last month, biochemist Yu Xue, 48, a naturalized American citizen, pleaded guilty to theft of cancer research she developed while working for pharmaceutical company GlaxoSmithKline, to help a Chinese government-backed company she set up in that country. Yu, who said most of the information was open-source data available on the internet, faces sentencing in December. A General Electric engineer, Xiaoqing Zheng, 55, a U.S. citizen, was arrested in August, accused of the theft of GE power-turbine technology, encrypting the data and hiding it in a digital image of a sunset. In July, a former Apple engineer, Zhang Xiaolang, who had worked on the company's self-driving car project, was charged with theft of trade secrets. He denies the charges that he took information from the company to benefit his new employer, a motor company in southern China. Massachusetts resident Shuren Qin, 41, was charged in June with shipping 78 hydrophones - underwater devices used to detect submarines - to a military research institute in Xi'an, China. And in January an ex-IBM software engineer, Jiaqiang Xu, 32, was sentenced to five years in jail for economic espionage and theft of the IBM computer coding. Several American former intelligence officials have also been charged recently with spying. In June, ex-CIA officer Kevin Mallory was convicted of spying and selling classified documents on defense to the Chinese. Mallory was approached by a Chinese intelligence operative posing as a headhunter via LinkedIn.